If you are planning on doing some landscaping, either this fall or next spring, there is plenty to think about. Here’s one good tip: Avoid digging up the lawn sprinkler system. This might sound silly on the surface, but it happens. And when it does, it can be expensive to fix. The key is, be smart and know where things are around your yard. Before any work begins, go over any plans or drawings given to you by the company that installed your lawn sprinkler system. The plans may located on or near the controller box in your house or garage. If you cannot find any drawings, reach out to your installation provider before any work is done in or around the yard. Get some graph paper and make a sketch of your yard. The graph paper will help with the measurements. Graphic paper has small squares, each of which will indicate one square foot. Find the backflow device. This is a device that looks like a pipe with a handle similar to that of a water faucet. Include this and other landmarks on your sketch. Find where a line should be at the edge of the map that crosses the area where will be taking place. Mark this area with a flag. Turn on your sprinklers and look for any possible leaks, no matter how small. Also look and see where the water is coming out of the sprinkler heads. Measure the distance from an existing landmark to each sprinkler head and draw the heads on your sketch in the corresponding locations. This should give you an accurate idea of where the water lines are located. 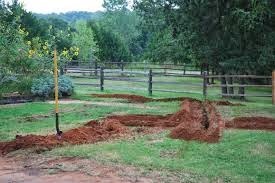 If you are doing the digging yourself, wet down the areas of digging with a garden hose. This will make the digging in the area a little easier. Oh, important reminder, if you smell gas during digging, call 911. Right away.